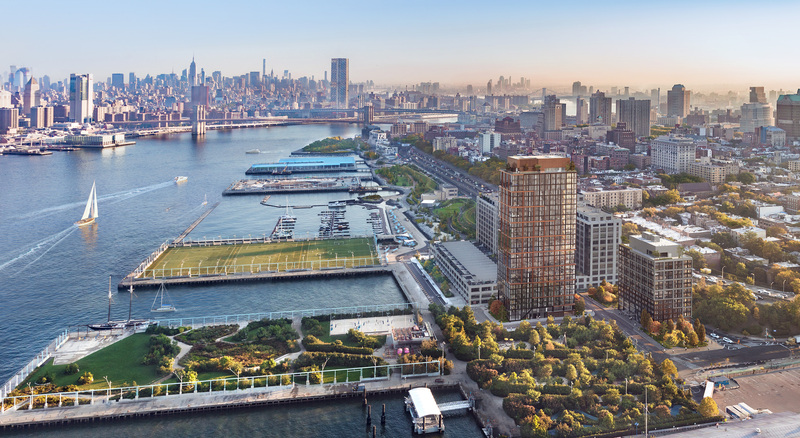 BROOKLYN HEIGHTS – A penthouse in the Quay Tower at Brooklyn Bridge Park’s Pier 6 is on the way to becoming the most expensive residence in Brooklyn. The posh pad recently went into contract for more than $20 million, which would break the current record for the priciest home in the borough—a $16.645 million penthouse at the Standish purchased by actor Matt Damon. Prior to Damon’s deal, a townhouse at 177 Pacific Street in Cobble Hill held the title for most expensive home in Brooklyn when it sold for $15.5 million in 2015. That was tied earlier this year when celeb couple Jennifer Connelly and Paul Bettany purchased a 19th-century Greek Revival townhouse in Brooklyn Heights for the same amount. 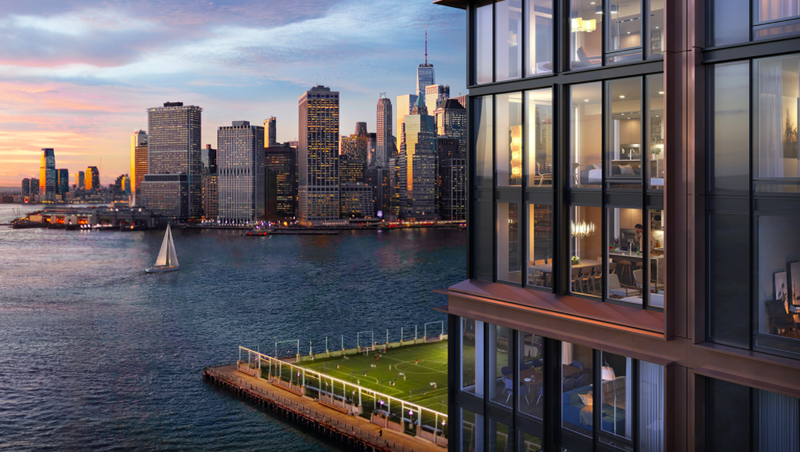 The record-breaking home situated on the 30th floor of the Quay Tower at 50 Bridge Park Drive combines two apartments, creating a five-bedroom unit with 7,433 square feet of interior space with a 1,179-square-foot terrace. The unit will be serviced by two elevators and will offer “smart home” technology with an Amazon Alexa device. Sales at the Quay Tower launched in the Spring and the first tenants are slated to move in Summer 2019. 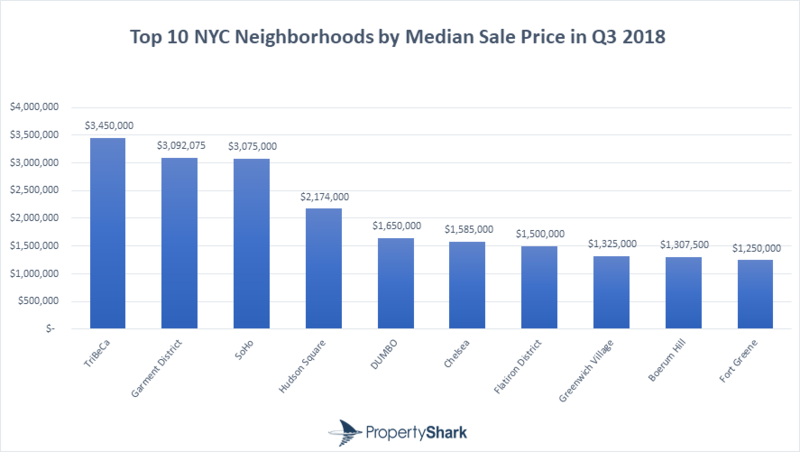 In other real estate news, Property Shark last week released NYC’s 50 most expensive neighborhoods for the third quarter of 2018. DUMBO came out on top for Brooklyn once again, showing up at number five on the overall list, with a median sale price of $1.65 million. Boerum Hill came in at number nine with a $1.3 million median sale price and Fort Greene finished off the top ten at $1.25 million. Prospect Heights saw a 34% year-over-year increase in sales, placing the neighborhood at number 11 on the list with a $1.25 million median sale price. 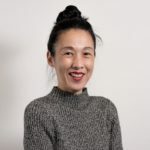 And with all the luxury real estate transactions happening in Brooklyn Heights, the neighborhood showed up at number 16 on Property Shark’s list, at a 19% decrease and median sale price of $1.15 million.